Is there another Brexit way for Theresa May? It's not easy these days to get through the day at Westminster without mentioning the dilemma of how to manage customs arrangements after Brexit. 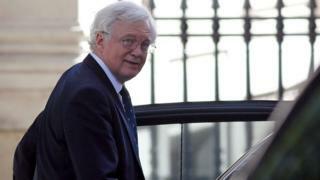 So, I'm not going to dwell on the fact that Brexit Secretary David Davis, who is understood to be pushing the prime minister to drop her preferred idea for a "customs partnership", saw her on Thursday morning; no doubt to make the case to abandon what one source described as a plan that is "not sensible or acceptable". And I'll only mention briefly that what's been striking this week is that people on the other side of that argument seem to be digging in as well. One told me: "It would all be rather easier if everyone would read the actual documents and understand them." Another told me: "We just have to show what is wrong with Max Fac." (A reference to the customs option preferred by Brexiteers). Despite some chatter about extending the post-Brexit transition period, which is due to run until 31 December 2020, when it comes to customs arrangements, I'm not the only person in Westminster to have written multiple times about how far apart the two sides of the Conservative Party are on this issue. And there doesn't seem much chance of them being brought together in short order either. What about giving up on that aim altogether? There's an argument, out there in the ether, that proposes the prime minister relinquishes the goal of party unity and does something rather different instead. Here is what sources have told me could be a new plan. The prime minister comes up with a soft-ish form of Brexit, something its supporters would describe as "sensible" or "pragmatic". It would probably mean being in a customs union - and certainly maintaining extremely close links with the EU - all with the goal of minimising the harm to the economy at the point of departure. Clearly, these ideas would be unacceptable to the well-organised and vocal Eurosceptic part of the Conservative Party. But that is something that just needs to be accepted, according to this plan. The theory suggests that the PM should instead make a direct appeal to Labour "moderates", as they are described by Tory Remainers, to entice them away from the position of their own front bench (which is very likely to vote against such a plan), to choose something that is "sensible" and "pragmatic". In theory, this could mean that when the crunch Brexit votes come, Theresa May wins - not because she has her party on board, but because she can get enough votes in Parliament from Labour MPs to get her plan through. It would be an appeal made beyond party politics, about the economic future of the country, so the argument goes. Would the government ever go for it? It would be highly unconventional to say "forget about that big swathe of your own side". It would be highly risky to believe too that enough of your opponents are ready to defy their tribe and go with you. But this is a minority government, with a real disconnect between both front benches and the troops behind them. In time Parliament could, theoretically (and I underline theoretically), force Theresa May to this position eventually in any case. No-one in officialdom would likely give this argument the time of day right now. But Theresa May doesn't exactly have a tempting range of options.